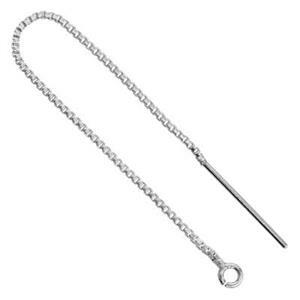 78mm 22 gauge Box Chain Sterling Silver Ear Thread, .9mm Box Chain, 1.6mm Open Ring ID. Order 2pcs to get one pair. Some people follow crumbs. Others follow a thread. All in all – you want it to lead you someplace good. A great thread to follow is the S0636 – .925 Sterling Silver 82mm 22 Gauge Box Chain Ear Threads. These have a 1.6mm inside diameter open ring on the end for adding whatever your creative jewelry designing heart desires: gemstones, crystals, charms, pearls.